One of the most significant developments in Obstetrics for 2013 was the publication of a 99-page report by the American Congress of Obstetricians and Gynecologists, Hypertension in Pregnancy. Hypertension (elevated blood pressure) affects over 10% of all pregnancies and there have been increases in the rate of pregnancy hypertension and preeclampsia (high blood pressure during pregnancy with protein in urine or other systemic conditions) by 25% in the last 20 years. Preeclampsia is a leading cause of maternal morbidity and mortality, with an estimated 50,000 preeclampsia-related deaths worldwide each year. There has been an increased interest in how to detect it earlier, how to prevent it and how to guide management of it. The most important topics in this new report have to do with management of the different complications of pregnancy hypertension, as they can be complex and range from mild impairment to severe pregnancy risks. This report contains important individual recommendations. The underlying theme is that the condition is not stable. Rather, it is progressive. These patients need to be watched very closely as mild preeclampsia can quickly progress to severe preeclampsia (see table) and can even worsen after delivery. Each of these diseases can progress, and for some patients early delivery is not an option, but is imperative. Close monitoring of the mother and baby is essential. There also needs to be an increased postpartum surveillance, as the disease may not improve for weeks after the baby is born. As some pain medications may make the problem worse, the use of nonsteroidal anti-inflammatory agents (such as Motrin, Aleve, Advil, and ibuprofen) should not be used for women who have elevated blood pressure more than one day post partum. Other pain mediations would be safer. Continued evaluation of both the patient and her fetus during pregnancy is to be followed by continued surveillance of the patient after delivery and discharge from the hospital. Magnesium sulfate used to be recommended for all patients with preeclampsia, but now the recommendation has been changed to use it only with preeclampsia where severe features are present. 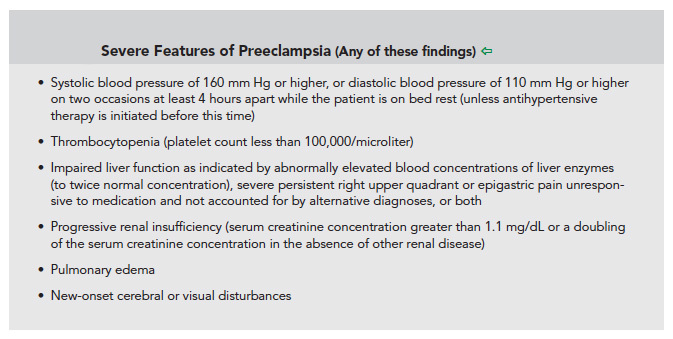 One recommendation emphasized is that the use of proteinuria for management of preeclampsia is useful for clinicians, but is not required for the diagnosis of preeclampsia if other preeclampsia conditions are present affecting the platelet count, the liver or other organs. As the diagnosis for preeclampsia used to be a rigid one, many women previously were not included in the diagnosis of preeclampsia and the progression of their disease may not have been detected as quickly. This new definition of preeclampsia is more inclusive and will help to identify those whose women who will now qualify for increased monitoring and expedited treatment. Hypertension is a problem that is pervasive throughout our society. Some women may already have it as they enter pregnancy. Pre-conception counseling can be helpful to control hypertension and diabetes and minimize obesity early on, making it less likely that elevated blood pressure will cause trouble during pregnancy and after. This entry was posted in Obstetrics and tagged American Congress of Obstetricians and Gynecologists, Obstetrics, Preeclampsia, Pregnancy. Bookmark the permalink.